Tiger Woods has made a "good case" to be a captain's selection for next month's US Ryder Cup team, US vice captain Davis Love said Tuesday at the PGA Championship. Love, who makes his 100th major start on Thursday at Bellerive Country Club, says 14-time major champion Woods has demonstrated solid reasons why he should be chosen in only eight months back after spinal fusion surgery. "I think he's got a good case," Love said. "There's a list of points per start, and he's done really well in that. He's got a lot of top-10s." Woods, who missed all of last season while rivals scored points, has jumped to 20th on the Cup qualifying list with only the PGA remaining before the top eight players qualify. Woods, set to be an assistant captain alongside Love in September's showdown with Europe at France's Le Golf National, must win the Wanamaker trophy for a record-tying fifth time to earn a berth on the US squad on points. 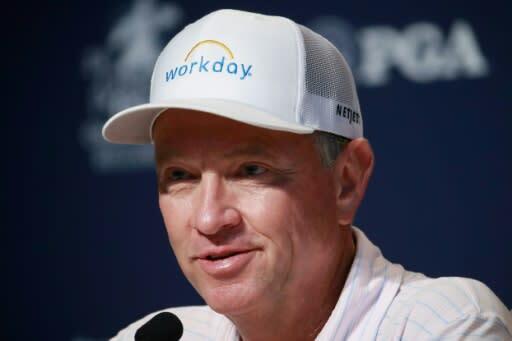 But US captain Jim Furyk makes four captain's picks next month and Woods figures to be a prime contender for one of them, according to Love, the US captain in 2012 and 2016. "The way I looked at it, if I was a captain, I'm looking to make pairings, and everybody on the team wants to play with Phil Mickelson or Tiger Woods," Love said. "So I think he's an easy pick from that regard and the way he's been playing, if I was on the other side, I wouldn't want him picked, so that's another good reason. "When we get in the room and we start talking about it, I'm sure he'll be definitely up on the list, if he doesn't make it." The only drawback Love could see from having Woods serve as a playing assistant captain is losing his voice when it comes time to make key decisions. "We would have to kick him out of some meetings, probably, (and) he has been so instrumental in helping us with pairings and ideas and game plan," Love said. "But if you're talking about him, you need him out of the room for picks or for making pairings. So it would be a little bit awkward. That would be the only negative. "But he has added so much value off the golf course for us the last two that, if we could have him for both this time, it would be great." At the 100th PGA Championship, Love becomes only the 14th player to reach 100 major appearances, the 54-year-old American having won his only major title at the 1997 PGA Championship. "It's amazing to be in that group, to make it that far," said Love, whose first major was the 1986 PGA. Love served as a caddie for his son at last year's US Open and 2017 PGA Championship winner Justin Thomas was once a teen prodigy sleeping in Love's house. "It's just amazing that I've literally seen his whole professional career," Love said. "The things I've gotten to see in golf, the cool stuff, it just never ends."